The Very Rev Andrew Swift will become the next Bishop of Brechin when he is consecrated in a special service held in St Paul’s Cathedral, Dundee on Saturday 25 August. The service will start at 2pm, following a procession of the Bishop Elect, members of the College of Bishops of the Scottish Episcopal Church, retired Bishops and clergy of St Paul’s Cathedral from the Caird Hall to the Cathedral (approximately 1.50pm). 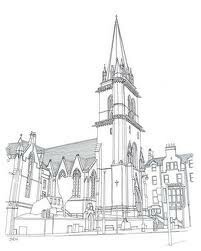 The service of consecration will be led by the Most Rev Mark Strange, Bishop of Moray, Ross & Caithness and Primus of the Scottish Episcopal Church, who says “It is with great joy that we are preparing for the consecration of the Very Rev Andrew Swift as Bishop of Brechin. The service in St Paul’s Cathedral will bring together people from across the Diocese and the Province to share in this moment of celebration. Members of the College of Bishops, together with visiting Bishops – including the Bishop of Iowa, the Rt Rev Alan Scarfe, and the Bishop of Swaziland, the Rt Rev Ellinah Wamukoya, will participate in the act of consecration (laying on of hands with prayer). The Diocese of Brechin is part of a companion link with Iowa and Swaziland, and so the role of Bishops Alan and Ellinah in the consecration is important in recognising the Diocese’s role within the world-wide Anglican Communion. Attendance at the service is by invitation only – as a packed Cathedral is anticipated with representatives of churches across the Diocese and the wider Church and from friends and family of the Bishop Elect from across the world. The Rt Rev Helen-Ann Hartley, Bishop of Ripon will preach the sermon. Bishop Helen-Ann is a friend of the Bishop Elect and was one of his tutors at theological college. For the first time ever in the Scottish Episcopal Church the service of consecration will be video live-streamed to enable anyone who wishes to do so to follow the service and feel part of it. The link to this will be available on the Scottish Episcopal Church website and Facebook page. The service is expected to last approximately 2 hours.